Acton, Donald F. et al. "Physiographic Regions". The Canadian Encyclopedia, 10 September 2018, Historica Canada. 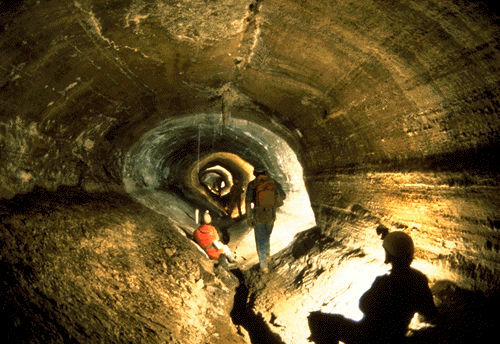 https://www.thecanadianencyclopedia.ca/en/article/physiographic-regions. Accessed 18 April 2019. 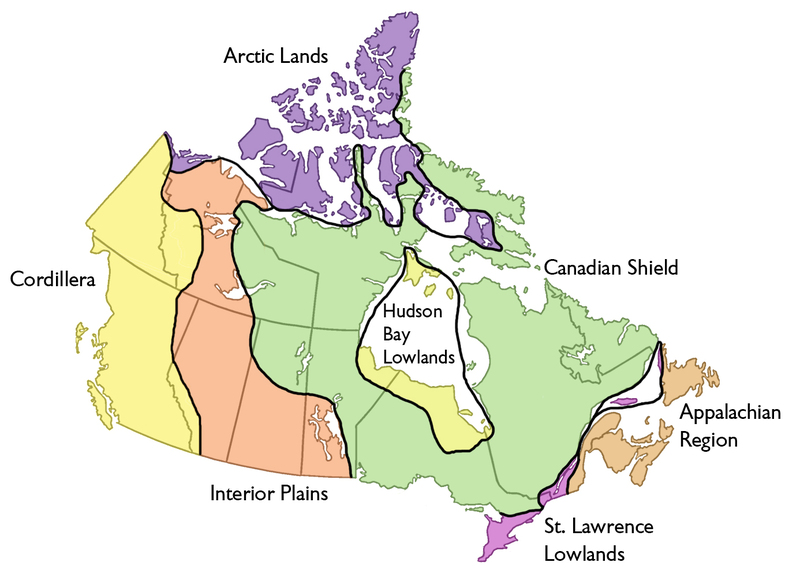 Canada may be divided into seven physiographic regions: Arctic Lands, Cordillera, Interior Plains, Hudson Bay Lowland, Canadian Shield Forest Lands, St Lawrence Lowlands and Appalachia. Interior Plains near Regina, Saskatchewan (photo by J.A. Kraulis/Masterfile). 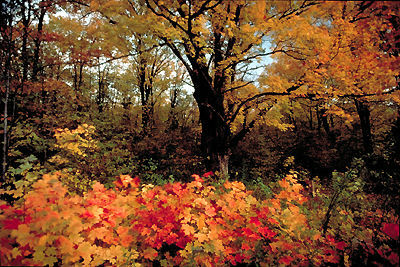 The mixed-wood forest is characteristic of the St Lawrence Lowland region (photo by Tim Fitzharris). Canada may be divided into seven physiographic regions: Arctic Lands, Cordillera, Interior Plains, Hudson Bay Lowland, Canadian Shield Forest Lands, St Lawrence Lowlands and Appalachia. Divisions are based on each area’s relatively similar physical geography and landforms. Physiography originally meant "the study of natural phenomena," but later usage limited its application to physical geography in particular and, more recently, to landforms alone. Physiographic regionalization is defined here as the process by which regions with relatively homogeneous physical geography are determined. Geologic structure (see Geological Regions), relief attributes of land, the distribution of continuous permafrost and the position of the treeline are the criteria used in the following physiographic regionalization. Combinations of these criteria, but with primary emphasis on geologic structures in southern Canada and the overwhelming influence of continuous permafrost in northern Canada, generate the major physiographic regions of Canada discussed in this article: Arctic Lands, Cordillera, Interior Plains, Hudson Bay Lowland, Canadian Shield Forest Lands, St Lawrence Lowlands and Appalachia. These seven large regions have broadly homogeneous physical geographic characteristics, and differences between them are visible from satellite images (see Remote Sensing). 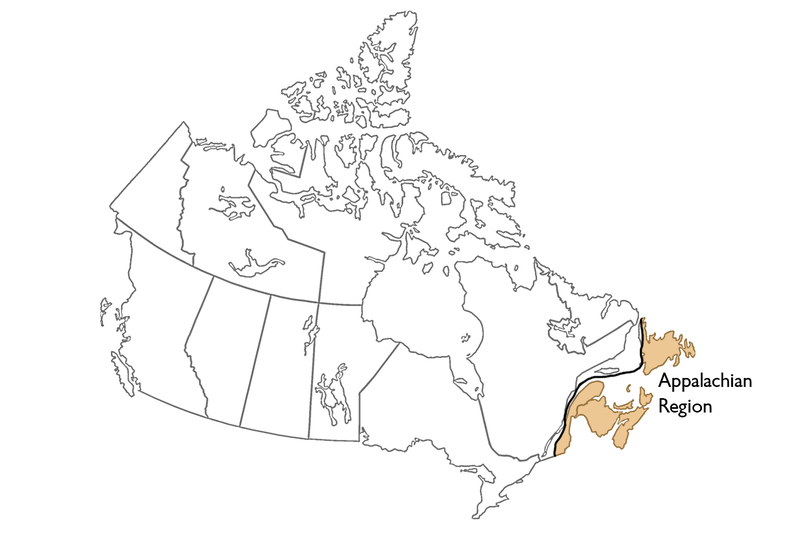 Areas quoted for these regions are the land areas and do not include adjacent continental shelves or bodies of ocean water within Canada's territorial limits. The ecozones of Canada (see Natural Regions) provide more detailed breakdowns of Canada's land mass based on an ecological classification system. Canada's Arctic Lands are generally thought to lie north of the treeline and cover 2.6 million km2 (26 per cent of the country). They include the Arctic Coastal Plains and Arctic Lowlands, the Innuitian Region of the High Arctic, and parts of the Canadian Shield in Nunavut, northern Québec and Labrador. However, extensive areas of Subarctic Lands must also be recognized. 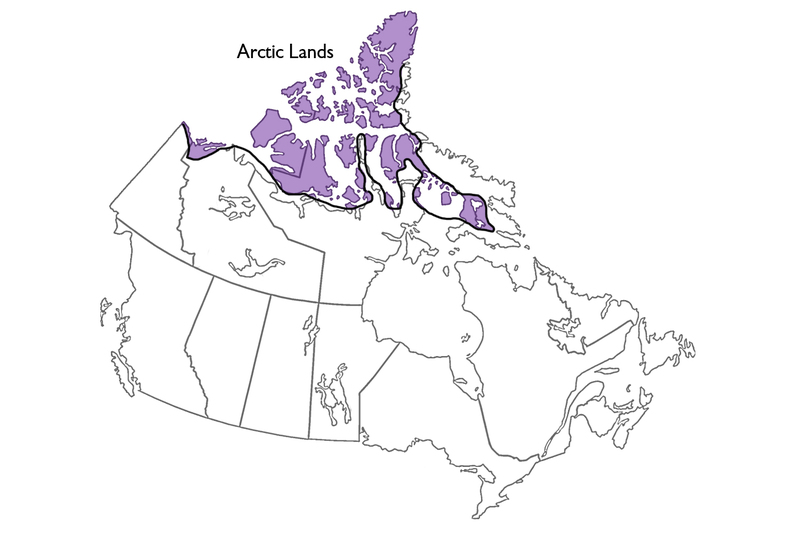 Taken together, Canada's Arctic and Subarctic Lands comprise nearly 40–45 per cent of Canada's land surface. Geological structure and lithology (i.e., physical characteristics of rock) largely shape the landscape. For example, the mainland east of Great Bear and Great Slave lakes, the Ungava Peninsula and most of Baffin Island are part of the Canadian Shield, and are composed of resistant igneous, metamorphic and sedimentary rock. Higher elevations consist of bedrock outcrops, while upland surfaces and upper valley-side slopes are covered by angular rock-rubble accumulations. Bedrock is disrupted by joint and fissure widening, and by its separation into angular blocks. By contrast, areas of unconsolidated sediments from the Paleocene to Quaternary periods (65 million to 10,000 years ago) form more undulating, poorly drained lowland terrain. Several distinctive landforms occur in the Arctic Lands, most often associated with the growth of permafrost and ground ice. Tundra polygons, a tortoise-shell pattern of cracks up to 30 m apart with ice wedges below the cracks, cover many thousands of square kilometres. Other distinctive periglacial landforms are pingos, over 1,500 of which have been counted near the Mackenzie Delta. Glaciation over much of northern Canada formed a landscape similar to an upright saucer with its centre flooded by Hudson Bay. The eastern rim, extending from Labrador north along Baffin Island and into Ellesmere Island, is a mountainous zone with elevations of 1,500 m and higher in the north, and a heavily fjorded coast. Glaciers cover about five per cent of the Arctic land surface. The zone between the Shield and the Western Cordillera is a Palaeozoic plain (542–253 million years old) gently sloping from 500 m in elevation downwards to the Arctic Ocean. The islands are mostly sedimentary rocks forming plains, uplands and hills. The rock layers in the south are mainly flat lying, but in the Arctic Archipelago they have been folded and then eroded. Surface elevations rise from near sea level in the northwest to approach the high mountain rim in the east. Faulting followed by further deepening during glaciation may have caused the many channels among the islands. Canada's Arctic lands are regarded as being either Arctic or subarctic in nature. The boundary between the two approximates the northern limit of trees. This is a zone, 30–150 km in extent, north of which trees are no longer able to survive. Ecologists refer to the barren, treeless Arctic as tundra. 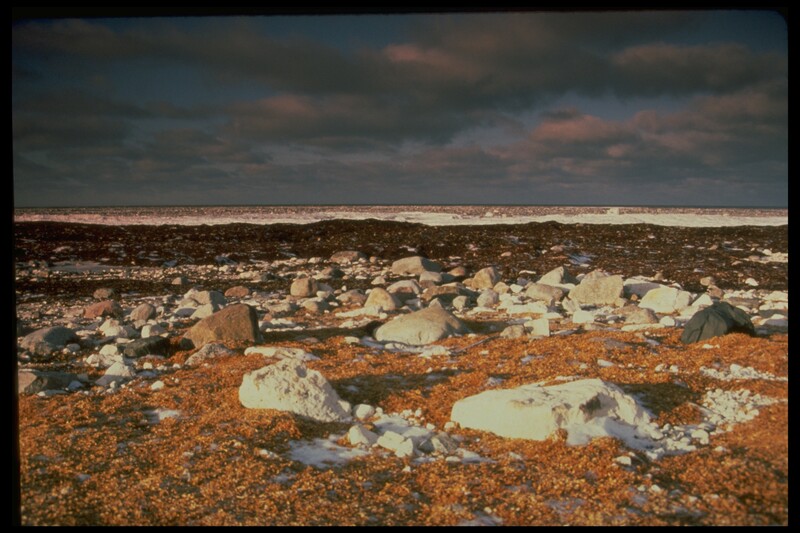 The tundra progressively changes into polar desert at extreme high latitude as climate becomes increasingly colder and drier. The treeline also approximates the southern boundary of the zone of continuous permafrost; that is, north of the treeline, the terrain is perennially frozen and the surface thaws for a period of only two-to-three months each year. Lakes and rivers are ice-free from June–October in the south and from July–August in the north; they are ice-covered for the rest of the year. 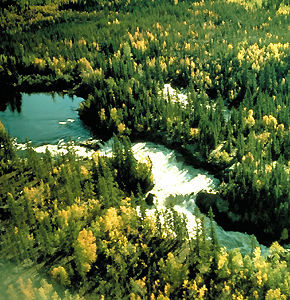 The largest river in Canada, the Mackenzie, flows north from Great Slave Lake and empties into the Beaufort Sea. This region is part of the mountain system that extends the length of the western third of North and South America. 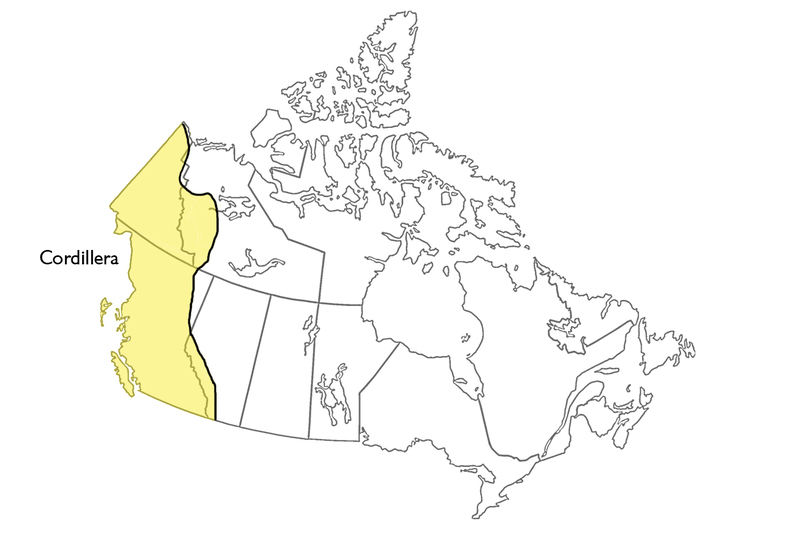 The Canadian part of the Cordillera is about 800 km wide, and extends from southern British Columbia north to the Yukon and the Beaufort Sea. While most of the Cordillera lies within these regions it also extends into southwestern Alberta and the Northwest Territories. The total area covered by this physiographic region is 1.6 million km2 (16 per cent of Canada). The Cordillera includes plateaus, valleys and plains as well as rugged mountains. The most continuous mountain chains, known as the Coast and Rocky Mountains, form high rims along the southwestern and southeastern sides of a belt of varied terrain. There are three distinct mountain systems within the Cordillera. The Eastern system consists of sedimentary rocks that have been tilted, faulted and folded. The Interior system's mountain ranges and dissected plateaus are underlain by folded sedimentary and layers of volcanic rock, by metamorphic rocks and numerous, small igneous intrusions. In the Western system, the Coast Mountains consist of a mass of interlocking igneous intrusions and metamorphic rocks, but the westernmost mountains (the Haida Gwaii and Vancouver Island ranges) are geologically similar to the Interior system. The oldest recognizable feature of the Cordilleran landscape is the gently rolling upland of its interior plateaus. This ancient surface was sculpted by erosion many millions of years ago. Since then, it has been uplifted, partly buried by lava flows, dissected by river erosion and modified by glaciers. The most widespread landforms and surface deposits of the Cordillera date from the glaciations of the past million years. South of 60° N, only the highest mountain peaks projected above the Cordilleran ice sheet. Farther north, extensive parts of the Yukon, Nunavut and the Northwest Territories were too dry for glacier formation, although very cold. In the glaciated areas landforms such as cirques (i.e., a basin with steep walls) and U-shaped valleys are common in the mountains and along the edges of higher plateaus. Features such as striations (i.e., grooves or channels), drumlins, eskers and till plains (i.e., a flat plain of glacial deposits) are widespread on plateaus and plains. Valleys and lowlands commonly contain thick silts and clays that were deposited in ice-dammed lakes during glacier melting, and sands and gravels that were deposited by meltwater streams. During the 12,000 years of postglacial time, rivers have formed terraces, alluvial fans, floodplains and deltas (see River Landform). Valley sides have been modified by rockfalls, debris flows, landslides, soil creep and snow avalanches. Periglacial landforms are present above the treeline. In the south, permafrost exists beneath only the highest, windswept ridge crests, but northward, the permafrost limit becomes lower and, in the central and northern Yukon, there is permafrost at all elevations. Volcanic activity has occurred sporadically at scattered locations in the Western and Interior systems up to the present. Some eruptions occurred during glaciation. The youngest lava flows and cinder cones are only a few hundred years old; these eruptions are described in certain legends told by Aboriginal peoples. The Cordillera encompasses a great variety of climates because of its great latitudinal extent, its location between the Pacific Ocean and the continental interior, and its rugged terrain. Several significant effects of climate are visible in the natural landscape. 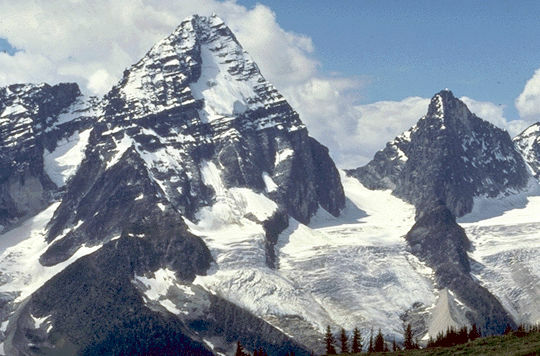 Heavy rain and snow on the Coast Mountains give rise to dense forests and maintain extensive snowfields and glaciers at relatively low elevations. The altitudinal timberline (i.e., the upper limit of forest) and the snowline rise eastward as snowfall decreases, and descend northward as temperature declines. Differences in climate caused by elevation in any particular area are reflected by altitudinal vegetation zones. The highest of these is the alpine tundra. In the semiarid valleys of the Interior system, the lowest vegetation zone is grassland. The Cordillera as a whole is distinguished by its mountainous and irregular topography, and its great variety of climates, soils and vegetation. Many aspects of its physiography, including steep slopes, natural hazards and severe climate, restrict land use by humans. 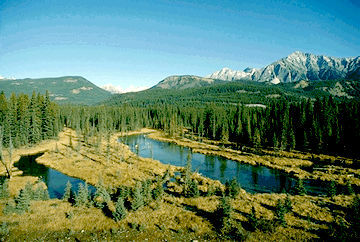 Other features, such as forests, grasslands, lakes and rivers are natural resources. The Interior Plains area of Canada encompasses the region between the Canadian Shield and the western Cordillera. 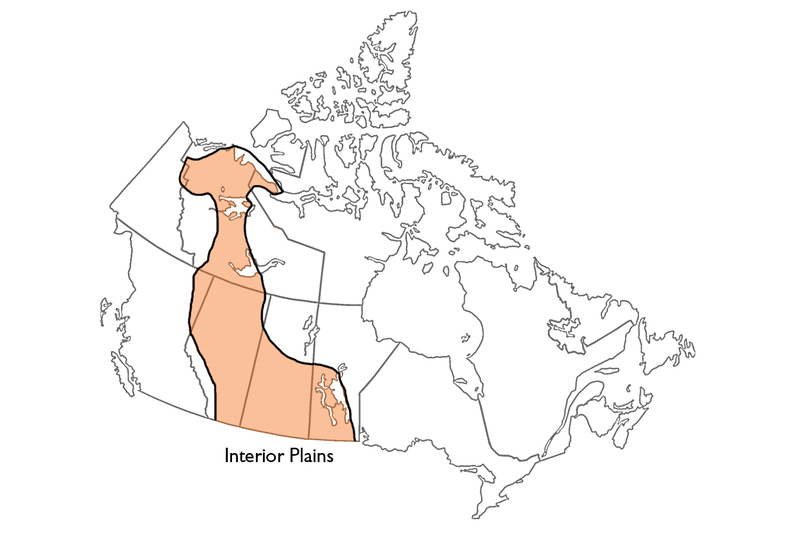 The plains are distinguished by vast expanses (1.8 million km2, or 18 per cent of Canada's land surface) of sedimentary bedrock consisting mainly of poorly consolidated shales, siltstones and sandstones. Bedrock relief plays a role in large-scale physiographic features, but small-scale features are largely the result of Quaternary glaciation (2.6 million to 10,000 years ago). Where the Interior Plains extend northwards, as in the Northwest Territories, they become subarctic in nature while, even further north in the islands of the western Canadian Arctic, they constitute tundra lowlands that are truly arctic in nature. The regional topography is partly determined by flat-lying limestones and shales of marine origin underlying the entire region. Younger, non-marine sediments, largely sands and gravels representing deposits from rivers flowing eastward from the newly developing mountains to the west, covered these marine sediments in the western part of the region. Erosion of the less resistant of these non-marine sediments, in association with uneven uplift that continued with mountain building to the west, resulted in the carving of the western part of the region into a series of isolated uplands. In addition to these erosional remnants, the relatively uniform slope of the southern portion of the region is broken into three steps (levels) by the Manitoba Escarpment and the Missouri Coteau. The first step is the Manitoba Plain in the southeast, which lies below the Manitoba Escarpment at elevations under 400 m. The Manitoba Plain is the lowest and flattest of the three prairie steps. The underlying Palaeozoic rocks (544–250 million years old) are covered by glacial lake silts and clays deposited by Lake Agassiz. The next step to the west is the Saskatchewan Plain, the dip slope of the Manitoba Escarpment, which is underlain primarily by marine shales of the Cretaceous age (144.2–65 million years ago). The marine bedrock is covered by glacial deposits, predominantly rolling moraines and till plains, and to a lesser extent, the large, flat deposits of former glacial lakes. 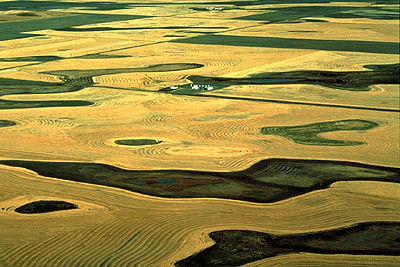 The Saskatchewan Plain, which is lower and smoother than the plains to the west, has surface elevations that range from 460 to 790 m, reaching 915 m in hillier areas. To the west of the Saskatchewan Plain lies the Missouri Coteau, a gradual slope upwards to the Rocky Mountains representing a thickening of non-marine sediments of the Cretaceous age. Beyond the Coteau, the third step begins with the Eastern Alberta Plains, only slightly higher than the Saskatchewan Plain, and extends to the Western Alberta Plains, where elevations reach 1,100 m. Except for the Cypress Hills, which are isolated, the Southern Alberta Uplands form a buffer between the plains and the mountains, with elevations approaching 1,650 m. This third step has a bolder, more varied relief, reflecting the close proximity of the erosion-resistant bedrock surface in many areas. Most striking are the badlands, formed from the dissection of soft underlying rocks in the arid southern region. The Northern Alberta Uplands, north of Lesser Slave Lake, are a series of disconnected plateaus rising 250–700 m from the surrounding Northern Alberta Lowlands to summits ranging from 760 to 1,050 m. The valleys of the Peace, Athabasca and Hay rivers are the most striking features in the lowlands. Glacial lake deposits and till plains, which are largely peat-covered, are widespread in the lowlands, whereas a mantle of glacial till (i.e., an unsorted mixture of clay, sand, etc.) covers most of the plateau areas. The Interior Plains continue northward to the Arctic Ocean where they are bounded by the Arctic Coastal Plain and Arctic Lowlands. Elevations generally decrease northward along the drainage of the Mackenzie River Valley, with a gentle rise eastward from the valley to the Precambrian Shield and a sharp rise, with several large plateaus, westward to the Rocky Mountains. The southern Interior Plains are mostly characterized by grassland vegetation (see Prairie) under semiarid climatic conditions throughout the plains, but islands of mixed-wood forest prevail at high elevations on uplands in western Alberta. 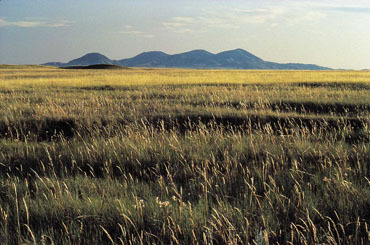 The grassland gives way to an aspen parkland to the north and east, under slightly cooler temperatures and higher precipitation. As this trend continues northward, a mixed-wood forest transitions to the dominantly coniferous boreal forest. Finally, at the northern extension of the Interior Plains, forest gives way to treeless tundra and polar deserts. This land area of 320,000 km2 (or 3.2 per cent of Canada's land surface) is only 40 per cent of a sedimentary basin in the middle of the Canadian Shield, the remaining 60 per cent of which lies beneath Hudson Bay and James Bay. Apart from the Sutton Ridges in the northeast of the lowland, the bedrock terrain is completely masked by a mantle of glacial and marine sediments associated with the advance and retreat of ice during the last glaciation. The inland edge of the lowland (about 180 m high) coincides approximately with the highest level of marine inundation which followed the disappearance of glacial ice from Hudson Bay about 7,500 years ago. Nearer the Shield adjacent to the lowlands are streamlined hills of glacial till (i.e., an unsorted mixture of clay, sand, etc. ), which were formed beneath ice moving southwest from Hudson Bay towards Manitoba, and south and southeast out of James Bay. These have not been totally masked by younger marine deposits and therefore give the surface a corrugated appearance. Closer to the coast, where the marine mantle is thicker, there are typically vast level plains of muskeg with thick peat accumulations and innumerable ponds. These plains contrast with terrain in a wide zone (50–80 km) inland of the coast. There, scores of parallel, gravel beach ridges were thrown up by storm waves during the last 5,000–6,000 years, as sea level fell in response to rapid uplift of the Earth's crust. Dry, forested, low ridges separated by boggy depressions characterize this zone. At the coast the almost level nearshore zone is exposed at low tide as marshy and muddy flats, often strewn with glacial boulders (see Wetlands). At present, sea level is still falling at approximately 90 cm per 100 years, continually exposing more of the offshore zone. In the eastern lowland, flooding by marine waters was immediately followed by a re-advance of the ice sheet margin approximately along longitude 76–77º west. This caused the moulding of the marine deposits into more prominent, streamlined hills. 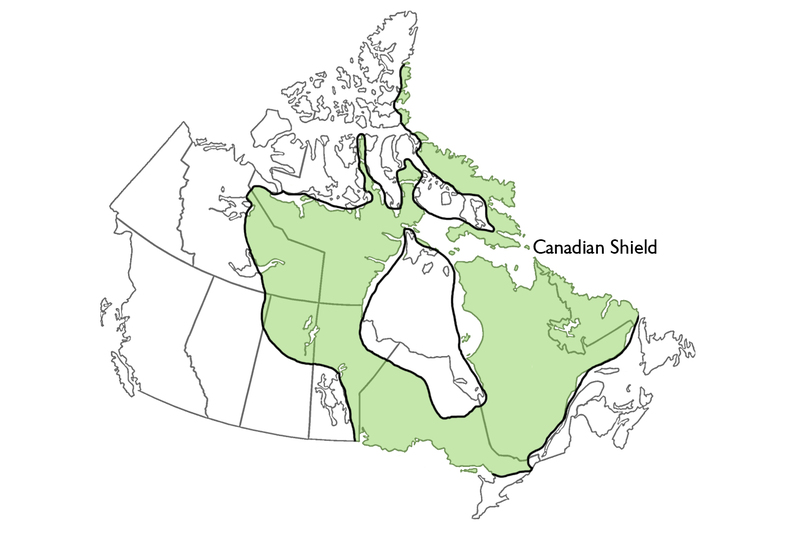 Shield proper (about 5 million km2) covers 48 per cent of Canada's land surface (including freshwater lakes and Arctic islands). Even if the Arctic Shield is excluded, the Canadian Shield Forest Lands remain the largest physiographic region in Canada, comprising 32 per cent of the land surface. It is a vast, saucer-shaped region: the rim on its south, east and northeast sides like that of a soup plate; the centre a sedimentary rock basin, the southern fringe of which underlies the Hudson Bay Lowland. The Shield is composed of crystalline Precambrian rocks formed during several phases of mountain building between four and one billion years ago. In the last billion years it has remained a relatively stable bulwark, unaffected by the plate tectonic movements, which have impinged on it to form the mountainous fringe of Canada. The stability of the Shield has allowed denudation to level its surface, giving it characteristic level or undulating skylines. The southeastern and eastern borders have been uplifted in the relatively recent geological past as a result of tectonic movements associated with the opening of the Atlantic Ocean. Glacial erosion had little effect, except along the eastern rim. Approximately half of the Shield is classified as upland. Extending from northwestern Québec through northern Ontario, Manitoba, Saskatchewan and southern Nunavut to northwestern mainland Nunavut and the eastern Mackenzie districts in the Northwest Territories, this terrain (200–500 m elevation) is upland only by virtue of its elevation above the Hudson Bay Lowland and the Interior Plains which border it. Bedrock relief of only 50–60 m has been smoothed by a thin mantle of glacial till (i.e., an unsorted mixture of clay, sand, etc.) and sediment deposited in glacial lakes. Hudson Bay and the Gulf of St Lawrence dominate the eastern Shield. Elevations increase from 300 m near the coasts to 900 m in central Labrador and Québec. Relief of 150–300 m is caused by incision of valleys into the higher terrain. At several places over the Shield, uplands and plateaus are broken by belts of hills. The relief of the hills increases because of differential erosion of linear geological structures formed in former mountain belts. Examples are the Labrador and Port Arthur hills. The high, rugged terrain along the east and southeast rim of the Shield is classified as highland. In Baffin Island and northern Labrador it stands at 800–1,500 m and possesses rolling plateau surfaces which are deeply dissected by glacial troughs, giving a fjord-like aspect to these coasts. Highlands north of the St Lawrence River stand at 500–900 m with isolated summits at 1,000–1,200 m in terrain, which is more dissected, with few plateaus. 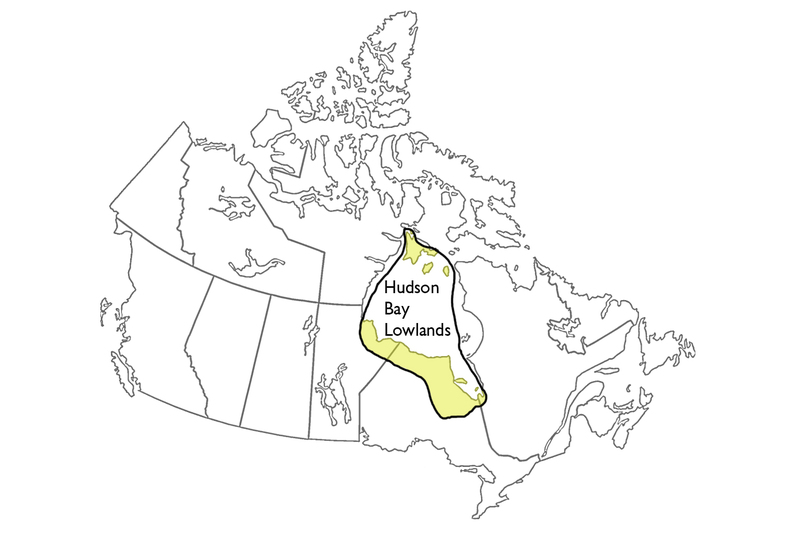 The two extensive shield zones, east and west of Hudson Bay, were the centres of ice sheet outflow during the last glaciation (from 75,000 to 6,000 years ago). The central parts of these zones show unorganized terrain mantled with till and also pocked with irregular, shallow lake basins. Around these, glacial scouring of the bedrock is more obvious, with occasional ice-moulded till hills and many eskers marking the courses of sub-glacial rivers, and large moraines marking pauses in retreat of the ice front across the Shield. The periphery of these two core areas is marked by more level terrain which was flooded by lakes and seas during ice retreat. This subregion lies between the Shield and lakes Huron, Erie and Ontario. 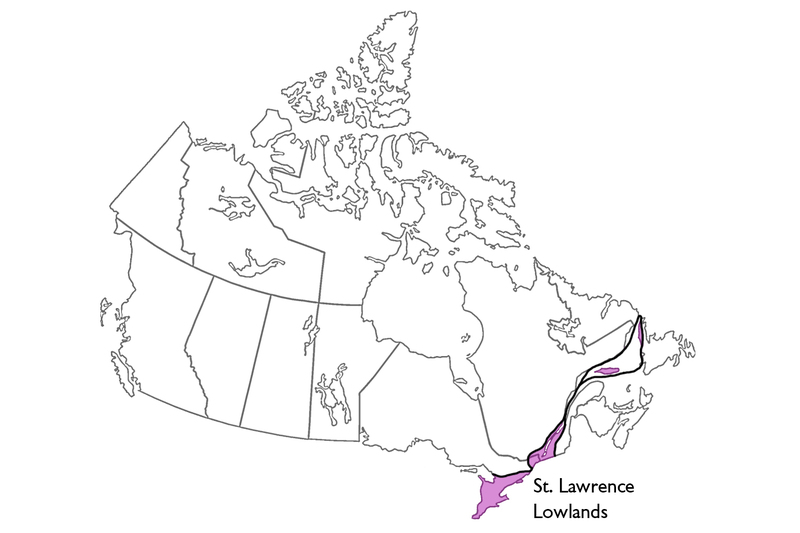 The West St Lawrence Lowland consists of a limestone plain (elevation 200–250 m) that is separated by a broad, shale lowland from a broader dolomite and limestone plateau west of Lake Ontario. This plateau is bounded by the Niagara Escarpment. From the escarpment the plateau slopes gently southwest to lakes Huron and Erie (elevation 173 m). Glaciation has mantled this subregion with several layers of glacial till (i.e., an unsorted mixture of clay, sand, etc. ), the youngest forming extensive, undulating till plains, often enclosing rolling drumlin fields. Prominent moraines on the western plateau and north of Lake Ontario mark temporary pauses in the retreat of glaciers, between 14,500 and 12,500 years ago. Level clay and sand plains, which were deposited in glacial lakes, fringe the present lakes. 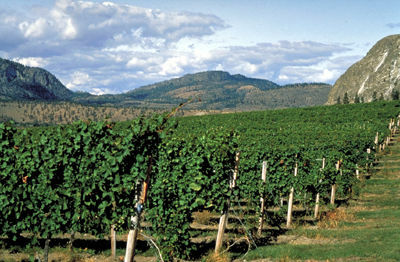 This subregion in southeastern Ontario and southern Québec has undulating topography, developed on sedimentary rocks that are largely masked by glacial and marine deposits. The seven Monteregian Hills (e.g., Mont Royal), which are aligned approximately west–east between the Shield west of Montréal and the Appalachians, stand at 200–500 m. They are the exhumed roots of volcanoes that formed as the Atlantic Ocean was forming about 120 million years ago. Along the Shield and Appalachian fringes of the lowland, sandy terraces (elevation up to 200 m) were deposited in the Champlain Sea, which flooded the newly deglaciated lowland approximately 13,000 years ago. These terraces have been eroded by postglacial streams to form more broken terrain. The low, rolling moraine trends southwest from near Québec City to near the Vermont border. This is a subregion that widens from the lower St Lawrence estuary into the Gulf of St Lawrence and narrows again to the northeast at the Strait of Belle Isle. There are small, isolated low plateaus and plains along the north shore of the Gulf of St Lawrence, such as Îles de Mingan; a coastal plain at less than 100 m in northwestern Newfoundland; and a larger, undulating plateau at 100–200 m with a central spine at 300 m on Île d'Anticosti. These fragments have a smooth terrain influenced by flat or gently dipping sedimentary bedrock. Surface conditions may be barren and dry, forested or boggy, depending on surface slope and the influence of coastal winds. The Appalachian Region (360,000 km2, about 3.6 per cent of Canada's land surface) lies between the St Lawrence Lowlands to the northwest and the Atlantic Continental Shelf to the east and southeast. Like other mountain regions, its terrain is a mosaic of uplands and lowlands, the characters, boundaries and shapes of which reflect the complexity of rocks and structures. These were inherited from tectonic movements between 480 and 280 million years ago. Since then, denudation (i.e., removal of surface layers) has removed several kilometres of rock, revealing once deeply buried structures. At the same time, regional uplift has maintained smooth-topped uplands and highlands on stronger rocks, while weaker rocks have been fashioned into lowlands and plains. Highlands and mountains are disposed in a Z-shaped belt, from the Québec border with Vermont and New Hampshire, northeastwards to the Gaspé Peninsula, then southwestwards across New Brunswick, and then continuing northeast north of the Bay of Fundy to Cape Breton Island. From there, broken by Cabot Strait, the belt continues along the high, western spine of Newfoundland. These highlands reach over 1,200 m in the central Gaspé Peninsula (Mont Jacques-Cartier, 1,268 m). In western Newfoundland and northeastern New Brunswick summits stand at 600–800 m; elsewhere in the region, this highland belt is flanked by uplands at 300–600 m in Québec, northwestern New Brunswick, southern and eastern Newfoundland, and southern Nova Scotia. Except in southern Nova Scotia, the uplands share with the highlands smoothly undulating skylines and deeply cut valleys. In eastern New Brunswick, Prince Edward Island, Îles de la Madeleine, northern Nova Scotia and the triangular Newfoundland Central Lowland, weaker rocks have allowed the development of plains and lowlands. In Newfoundland and southern Nova Scotia, terrain strongly resembles that of the Shield, with extensive, glacially smoothed bedrock plains, patchily covered with bouldery till and dotted with irregular lakes. In the rest of the region, even highland and mountain zones show only locally severe glacial erosion, particularly in valleys crossing the "grain" of the terrain. Glacial deposits are thicker there and the soil is mostly sandy and infertile. With deglaciation, between 14,000 and 10,000 years ago, crustal uplift was sufficiently great to exceed sea-level rise in the central and northern zones of the Appalachian Region, so that a coastal fringe exhibits raised marine terraces which often provide pockets of sandy, arable land. In the south, bordering the Atlantic Ocean, post-glacial sea-level rise has exceeded uplift along this submerging coast with rocky headlands, irregular bays and salt marshes. Sea level continues to rise at up to 30 cm per 100 years. Hugh S. Bostock, "Physiographic Regions of Canada," Geological Survey of Canada Map 1245-A (1967); Olav Slaymaker, "Physiography of Canada and Its Effects on Geomorphic Processes," Quaternary Geology of Canada and Greenland (1989); Alan S. Trenhaile, Geomorphology: A Canadian Perspective (1998, 4th edition, 2010) and The Geomorphology of Canada (1990). Physiographic RegionsA map of the physiographic regions of Canada from National Resources Canada. Canada's EcozonesClick on the map to view the natural history of specific ecozones in Canada. From McGill University.